Our State Legacy: State trust lands were granted by Congress to produce non-tax revenue for essential public institutions. Among the largest beneficiary of the land grants is K-12 public schools, but also included are public buildings, universities and counties. The beneficiaries rely on responsible management. As manager of state trust lands, the Dept. of Natural Resources (DNR) has a legal fiduciary responsibility to generate revenue in perpetuity, and maintain an undivided loyalty to the beneficiaries while managing trust assets prudently. (WA Supreme Court: Skamania vs. State of WA 1984). More than half of the trust lands are set aside for conservation. 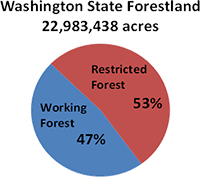 Sustainable Timber Harvest: While sustainable timber harvesting is the largest proportion of revenue generated for the beneficiaries (63% in 2015), other revenue producing activities include solar and wind energy, communication towers, agricultural land leases, easements, and aquaculture—such as geoducks and other shellfish. There is no coal or oil extraction on DNR trust lands. 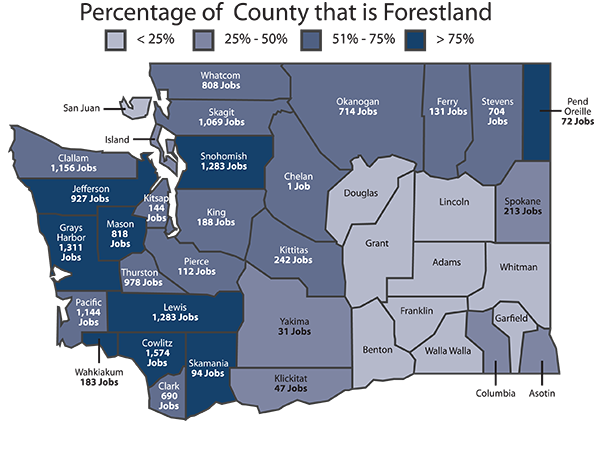 Click on the map to find out the economic impact of working forests in your county.